Nanoemulsions – also known as miniemulsions or submicron emulsions – are used in a wide range of applications in chemistry, paints & coatings, cosmetics, pharmaceuticals and food. Ultrasonic systems are known as reliable tools for the production of long-term stable nanoemulsions. 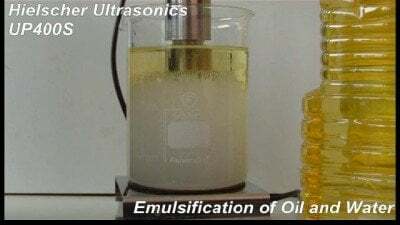 Ultrasonic emulsification is caused by coupling the waves of power ultrasound into a liquid system. By sonicating a liquid, two mechanisms occur: (1) The acoustic field generates waves that travel through the liquid and cause microturbulences and an interfacial movement. Thereby, the boundary phase becomes unstable, so that the dispersed (internal) phase eventually breaks and forms droplets in the continuous (external) phase. (2) The application of low-frequency, high power ultrasonics generates cavitation (Kentish et al. 2008). By ultrasonic cavitation, microbubbles or voids are formed in the medium due to the pressure cycles of the ultrasound wave. The microbubbles / voids grow over several wave cycles until they collapse violently. This bubble implosion causes locally extreme conditions such as very high shear, liquid jets, and extreme heating and cooling rates (Suslick 1999). These extreme forces break primary droplets of dispersed (internal) phase down to nanosize droplet and mix them homogeneously into the continuous (external) phase. Read here more about ultrasonic cavitation! Lipid miniemulsions – produced by ultrasonics – are widely applied as carrier for pharmacological agents in pharmaceutical formulations. For instance, miniemulsions can act as parenteral drug carrier or drug delivery device to target tissues. Besides of the high bioavailability of the encapsulated active compounds, the advantages of miniemulsions lie in their high biocompatibility, biodegradability, stability, and ease of large-scale production. Due to their structural properties, they can incorporate hydrophobic as well as amphipathic molecules. Ultrasonically prepared nanoemulsions have been loaded with tocopherols, vitamins, curcurmin and many other pharmacological substances. Hielscher’s ultrasonic systems are reliable emulsifiers for the preparation of drug-loded nanoemulsions. For the ultrasonic emulsification, Hielscher offers various accessories to optimize the emulsifying process. Hielscher’s MultiPhaseCavitator is an unique add-on for ultrasonic flow cells, where the second phase is injected as very narrow stream directly into the ultrasonic “hot zone” of emulsification. Nanoemulsions offer various benefits for the formulation of food products. Nanoemulsions show a good stability to gravitational separation, flocculation, coalescence, and offer controlled release and/or absorption of functional ingredients due to their small droplet size and large surface area. Additionally, they offer a high bioavailability of active compounds which is important for the delivery of nutrients and active substances. Furthermore, they offer good formulation properties since they are transparent or visually translucent and their submicron- / nano-size droplets cause a smooth and creamy mouth feel. Thereby, the production of stable nano-emulsions is an omnipresent task for the food industry, e.g. to formulate vitamin or fatty acid fortified products (e.g. vitamin C, vitamin E omega-3, omega-6, omega-9 derived from plant seed or fish oil) or to produce flavoured products (e.g. with essential oils). Especially water-in-oil (W/O) nanoemulsions offer various benefits for the encapsulation of bioactive hydrophilic substance into nanoscale droplets (in single or double emulsions). Click here to read more about the surfactant-free formulation of cosmetic emulsions with ultrasonics! Ultrasonically assisted miniemulsion polymerization is applied to various processes – from the encapsulation of inorganic particles to the synthesis of latex particles. The application of power ultrasound to chemical reactions such as polymerization, synthesis etc. are known as sonochemistry. Click here to read more about sonochemistry, the ultrasonic synthesis of latex and the ultrasonic precipitation! Although some nanoemulsions can be shelf stable without the use of any surfactants or emulsifiers due to the nano-scaled droplet size and distribution, other nanoemulsions require the use of stabilizing agents to obtain long-term stability and optimal product quality. Stabilization can be accomplished by adding either surfactants (tensids) or solid particles which act as stabilizers. Emulsions, which are stabilized by solid particles are known as Pickering emulsions. Lactose, albumin, lecithin, chitosan, maltodextrin, starch etc. can be used as colloidal stabilizers in Pickering emulsions. Click here to learn more about ultrasonically generated Pickering emulsions! Ultrasonic emulsification can be performed for all types of emulsions. If a stabilizing agent is required for a specific emulsion, can be easily tested in small scale. Please note that the amount of required surfactant increases with a decreasing droplet size since the surface-area-to-volume ratio (S/V) for spheres is given by: S/V = 3/R. For example, the smaller the diameter of a particle or droplet, the more surface area it has relative to its volume. The production of stable submicron- and nano-emulsions requires powerful ultrasonic equipment. Hielscher ultrasonic emulsification equipment delivers very high amplitudes (up to 200µm for industrial ultrasonicators, higher amplitudes on request) to generate an intense acoustic field. However, for the production of stable nanoemulsions, power ultrasound equipment alone is often not sufficient. Besides sufficient ultrasonic power, precise control of the process parameters, and sophisticated accessories (such as sonotrodes, flow cell reactors, cooling) are necessary to obtain nano-sized droplets and a homogeneous dispersion of both, the aqueous and oil phase into each other. To produce superior emulsions, Hielscher’s powerful ultrasonic processors in combination with the MultiPhaseCavitator gives you the optimum hardware. Hielscher Ultrasonics is specialized in supplying superior ultrasonic systems and accessories for optimum processing results. Our long-term experience in ultrasonic processing and our close cooperation with our clients ensures the successful implementation of ultrasonics into production lines. For initial tests, process development and process optimization, we offer a fully equipped process lab and technical center. Furthermore, we offer in-depth consulting, the development of customized ultrasonic systems and profound technical service for installation, training, and maintenance. Kentish, S.; Wooster, T.; Ashokkumar, M.; Simons, L. (2008): The use of ultrasonics for nanoemulsion preparation. Innovative Food Science & Emerging Technologies 9(2):170-175. Suslick, K.S. (1999): Application of Ultrasound to Materials Chemistry. Annu. Rev. Mater. Sci. 1999. 29: 295–326. Emulsions are defined as two immiscible liquids: One of the liquids – the so-called dispersed or internal phase – is dispersed as spherical droplets within the other liquid, known as continuous or external phase. The most prominent liquids used to form an emulsion are oil and water. When the oil phase is dispersed in the water/aqueous phase, the system is an oil-in-water emulsion, whilst when the water/aqueous phase is dispersed in the oil phase, it is a water-in-oil emulsion. Emulsions are distinguished respectively their particle size and thermodynamic stability as macroemulsions, microemulsions, and nanoemulsions, respectively. Nanoemulsions are nanoparticulate dispersions, which consist in nano-sized droplets. The high shear forces of power ultrasound rupture the droplets so that they are reduced to submicron and nano diameter. Generally, smaller droplet sizes lead to greater emulsion stability. Nanoemulsions can be distinguished as O/W (oil-in-water), W/O (water-in-oil) or as multiple/double emulsions such as W/O/W and O/W/O. Nanoemulsion are transparent or even translucent (in the visible spectrum) depending on the consistency and droplet size. Nanoemulsions are generally defined by a droplet size between 20 and 200nm. With a descending droplet size, the emulsion’s propensity for coalescence is decreasing (decreasing Ostwald ripening). Nanomaterials and nanoemulsions are characterized by physical properties that differ from microemulsions. Nano-sized particles show either completely different properties or their typical properties are expressed in a very extreme form. The visible appearance of nanoemulsions have a different appearance than micron-sized emulsions since the droplets are too small to interfere with the optical wavelengths of the visible spectrum. Therefore nanoemulsions exhibit very little light scattering and appear transparent or optically translucent. The droplet size of an emulsion is influenced by the composition of the oil phase, the interfacial properties and viscosity of both, the continuous and dispersed phases, the type emulsifier/surfactant, shear rate during emulsification, as well as the solubility of the oil phase in water. Nanoemulsions are widely used in diverse applications such as drug delivery, food & beverages, cosmetics, pharmaceuticals, and material science & synthesis. Emulsifiers are an essential factor to prepare a stable emulsion / nanoemulsion. Emulsifiers are surface-active agents that form a protective layer about the droplet and reduce the interfacial tension, thereby preventing Ostwald ripening, coalescence, and creaming. Small molecule surfactants: Non-ionic emulsifier such as Tween and Span show a low toxicity and irritancy when administered orally, parenterally and dermally and are therefore preferred over ionic emulsifiers. Tween and Span are the preferred stabilizers for emulsion formulations in the food, pharmaceutical and cosmectic industry. Tweens: Tween 20/60/80 are known as polysorbate 20/60/80 (PEG-20 dehydrated sorbierite monolaurate, PEG-20 dehydrated sorbierite monostearate, polyoxyethylene sorbitan monooleate). They are nonionic surfactants / emulsifiers derived from sorbitol. They easily dissolves in water, ethanol, methanol or ethyl acetate, but only a little in mineral oil. Spans: Span20/40/60/80 are sorbitan fatty acid esters / sorbitan esters, which are non-ionic surfactants with emulsifying, dispersing, and wetting properties. Span surfactants are produced by the dehydration of sorbitol.